Near our office in Shanghai is a little shop that serve very good Xinjiang 新疆 cuisine. Xinjiang is an autonomous area in the North-western region of China that features green pastures, mountain air, honeydews and dates. Majority Muslims, their cuisine is heavily influenced by the Arabian in terms of the use of spices and Halal due to their religious inclinations. I was craving for my fix of lamb so I went looking for this hole in the wall place. This place is not bad and as authentic as you can get. The patriarch, a gentleman with a big white beard, sat behind the counter and gave orders to the troops (and counting money at the same time). Army of young Xinjiang waiters ran about taking orders. The clientele was a mix of Chinese and Xinjiang natives. The place is so packed that I need to share table with another 3 natives – Xinjiang ladies with blue eyes :-). When I was in Shanghai in 1996, a lamb kebab (that is twice as long) was 1 Yuan, exchange was S$1 = 6 Yuan. Now, it is 4 Yuan and S$1 = 5 Yuan. Thanks to a booming Chinese economy and inflation. 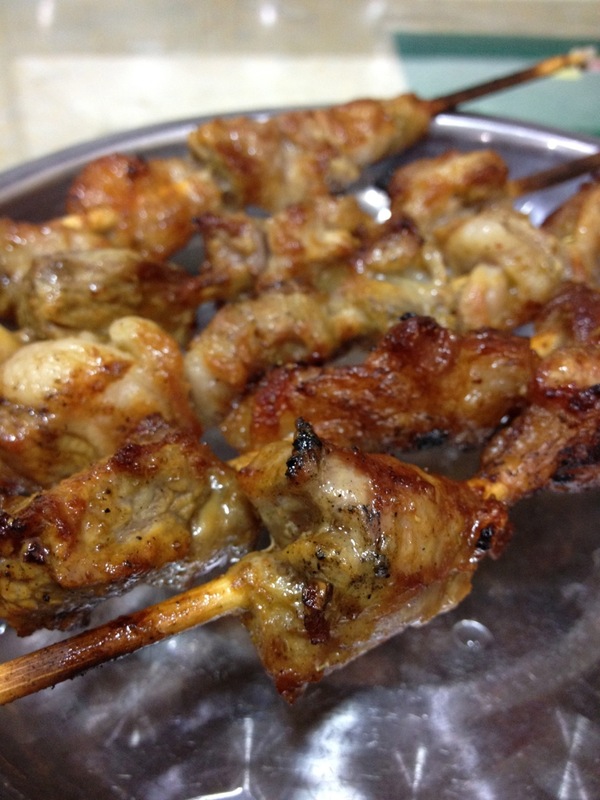 The kebab (only one choice of meat) was a skewer of delights – lean lamb pieces alternated with lamb fats. The kebab was roasted over open charcoal fire and sprinkled liberally with herbs and spices. The end result was a well-roasted skewer of absolute savory. As I was alone, I could not order too much so I had only kebabs, chicken stew 大盆雞(a bit like our curry chicken nee the coconut milk) and fried noodles knobs 丁丁炒麵 (like Banmian but fried like mee goreng). I finished every morsel of the food not because I was hungry, but more in appreciation of the heart and soul the cook placed in whipping out these simple fares. Address to follow once I figured it out. But it is just behind Howard Johnson hotel in 九江路. Can’t miss it as you can see the bellowing smoke of the roasting kebabs. Just follow the smell of BBQ.